In this part of the series we provide guidance on the completion of the Tests in section 4 of the CoC. Please be aware that where SANS 10142-1 Edition 1.8 has been referenced in this series, some numbering will be slightly different to those clauses in the recently published SANS 10142-1 Edition 2.0. 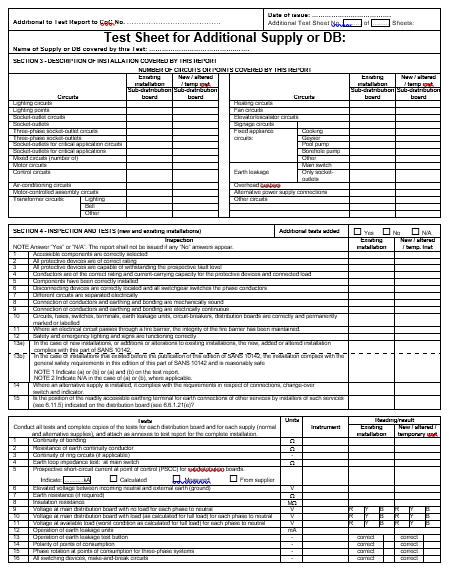 … As well as the reminder at the top of section 4 of the test report. The reason for this is that virtually all readings will differ from those at the main DB, mostly due to the increase in conductor length from the source. 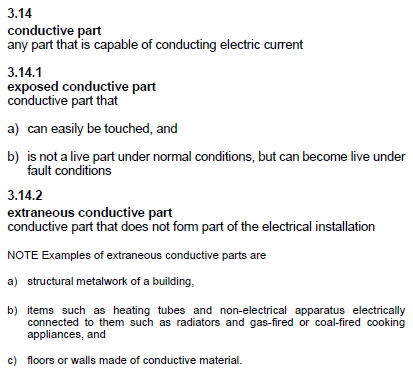 It also serves to confirm continuity of earthing conductors, operation of protection devices, voltages etc. Obviously different sources like mains, generator and/or inverter, will each have different characteristics, and all readings will differ according to the source in use at that instant. You may make your own reproduction, or photocopy of the original, or make use of the additional test sheets that the ECA has made available for this purpose (three of these on one A4 sheet). In instances where there are only one or two minor sub DBs, for example, outbuildings at a house with only a few circuits each, simply duplicating the ‘Tests’ portion as below and recording the numbers of points and circuits under the sub-DB columns of section 3 may suffice. Detailed instructions can be found under Clause 8 in SANS 10142-1. We have already dealt with the preceding sub-clauses of Clause 8, and resume at sub-clause 8.6: TESTING. Before commencing with the testing, some precautions and arrangements need to be attended to. Make arrangements with the owners or tenants so that you do not interfere with work they may be busy with, for example, computers and telephone systems, processes such as incubation, and work on machines like lathes and similar. Unplug all appliances, particularly items such as fridges, as repeated restarting may cause damage to compressors. Remember to re-instate everything after completion, or you may face claims for defrosted freezers etc. In environments such as offices, it may be advisable to arrange to do these outside of normal working hours to mitigate disruption of the business. In areas where sparks or other discharges may be harmful like environments where there may be flammable gas present, tests such as insulation resistance tests at 1 000 V may cause ignition or explosions. In such cases, consider using other safer means of determination, or take steps to mitigate the risk. If not possible, you are allowed to not do this test. In some instances, there may be sensitive (electronic) equipment connected to the installation. 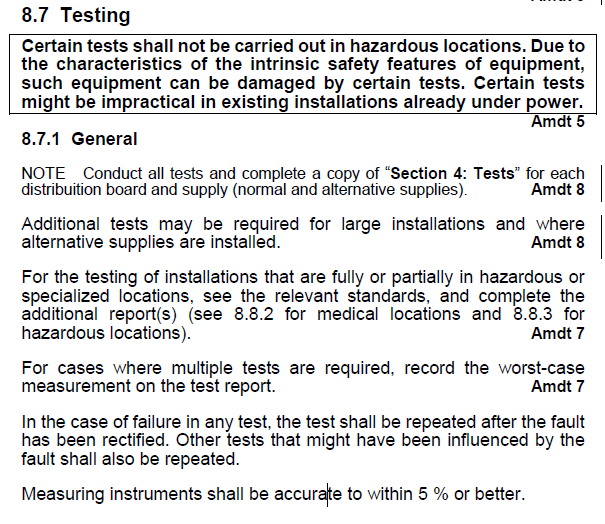 To prevent damage thereto, the equipment may have to be disconnected before applying excessively high test voltage; or the test may also not be done. 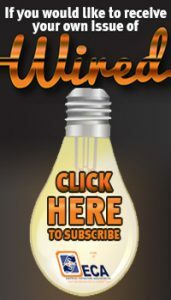 In cases where there are many connected appliances, such as fluorescent lights which have been connected to the supply voltage, and they are operational this can be taken as confirmation that there are no short-circuits present, and an insulation resistance test to prove this is considered superfluous. This is especially relevant where it might be impractical or onerous to disconnect many items to do this test. These general requirements apply to all testing. We have previously discussed that a copy of section 4 must be completed for every DB and supply. 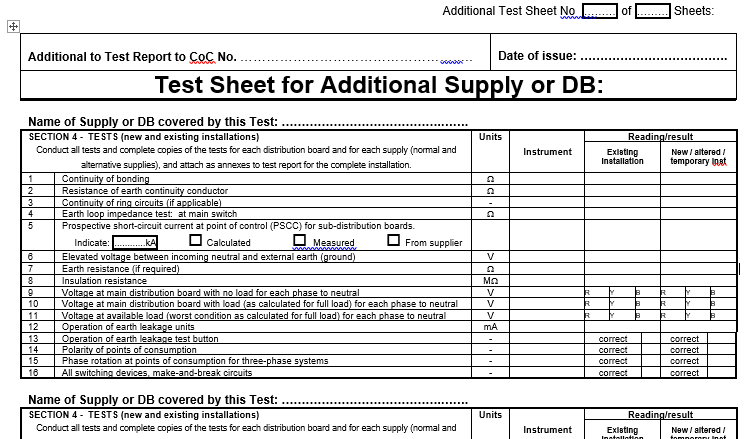 At larger and more complex installations this test report may not suffice, and you may need to create a more comprehensive report yourself. 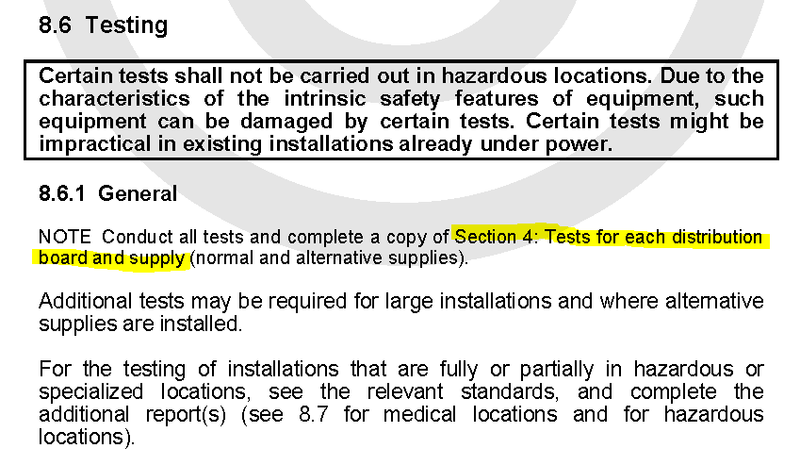 For specialised locations, like hazardous or medical installations, MV or earthing and lightning protection installations, the relevant standards should be consulted and adhered to, and the additional tests or safety reports prescribed therein be attached. NOTE that this CoC does not cover and may not be issued for electric fence installations. A completely different CoC, issued by a person specially registered (licenced) as an ‘Electric Fence System Installer’ (EFSI), is required. Where the same test is done several times but there is only provision for one entry on the form, for instance ‘Continuity of bonding conductor’ and ‘Resistance of ECC’, insert only the worst-case value in the allotted space. Should any of the tests you do not comply with the requirements, you need to investigate that item and do the necessary repairs. Once that is done, you need to re-do that test until it is compliant. If the work done may have influenced another test that has already been completed, you need to re-test that as well to ensure it has not been compromised. An item that we found many are not aware of, is the requirement that measuring instruments must be accurate within 5%. Most new instruments come with documentation claiming excellent accuracy. The accuracy of older instruments must be confirmed regularly. Note that run-down batteries may also result in inaccuracies. If a CoC that you have issued is challenged, you may have to substantiate that you ensured the compliance of the instruments used. If compliant, confirm your findings as below by inserting the worst-case reading into the allocated space. Although it may appear to be the same test as the previous one, it is not. The previous test is to confirm that parts are bonded together, and the resistance is such that a potential difference between parts will be kept at safe levels in the event any part becoming alive. The tests are done basically to exposed parts with covers on, thus to covers and screws etc. More details can be found in sub-clause 6.13 of the Code. This test is primarily intended to ensure that the resistance of the ECC is such that it will ensure the operation of protective equipment and thereby limiting the rise of touch voltages to safe levels, and within a limited time. These tests are done to the earthing terminals of equipment. Refer to sub-clause 6.12. 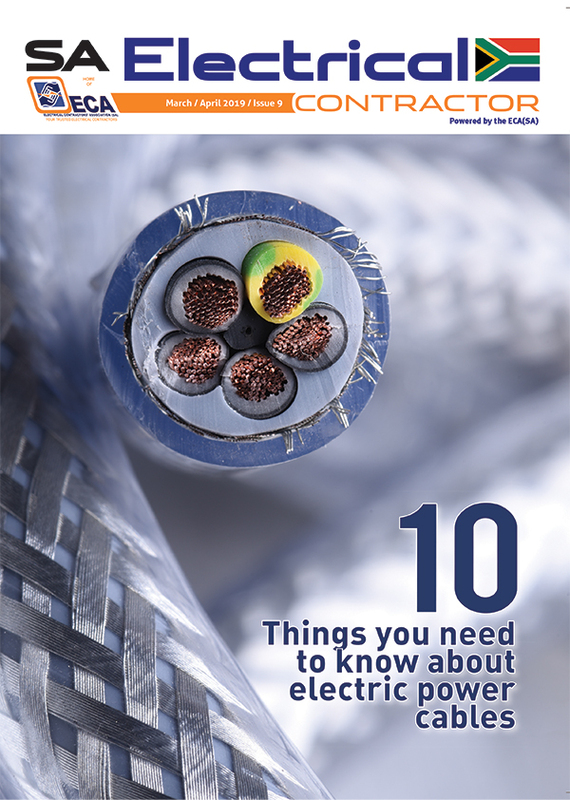 Because of varying loads and associated cable sizes, the ratings of the protective equipment will vary accordingly. This, in turn, will cause different potential rises on faults, hence the prescribed maximum values vary according to the rating of the protective devices, as set out in Table 8.1. 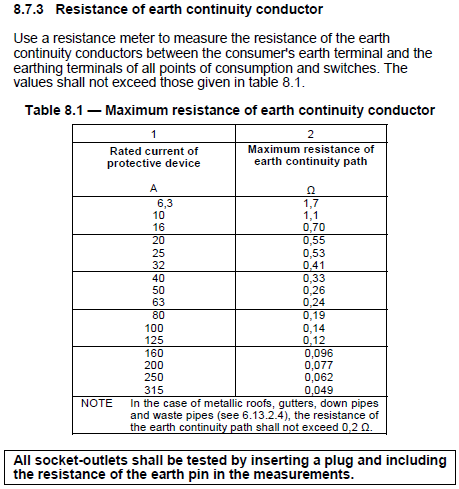 Note the additional requirement that the ECC of sockets must be tested by inserting a pin into the socket to ensure that the connection between the plug-top and socket is included in the test circuit. 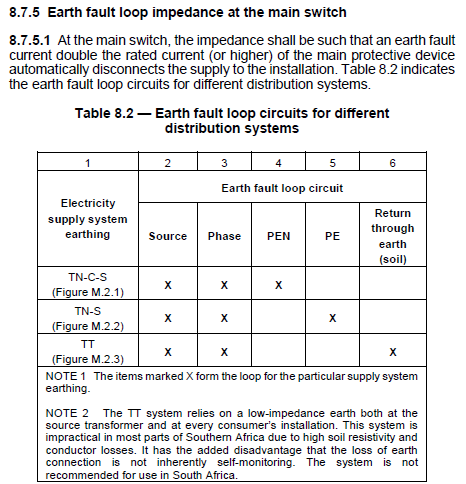 Due to the fact that in domestic circuits the earthing terminal and exposed portion of equipment are usually very close together (if not the same), and the same conductor is used, the test results are usually similar to the extent that this contributes to the aforementioned confusion. In commercial and industrial installations where larger loads and protective equipment are used, the distinction between the two tests becomes more evident. If all the results are compliant, insert the worst-case values in the appropriate space. Ring circuits are very rarely used in South Africa, except perhaps in office blocks. If there are no ring circuits in the installation you are testing, insert ‘N/A’ into the allotted space and move on. Ring circuits are effectively a parallel arrangement where two conductors are connected to the source, and then supply one or more items in a circular fashion. Due to the conductors being in parallel, they share the load, and the conductor size may be reduced. Hence this test point is to ensure that both conductors remain firmly connected and one cannot be overloaded due to the lost connection of the other. This has to be done for both live and neutral, and at the same time identification and crimping must be confirmed at all connection points as well. Confirm compliance in the allotted space. The purpose of the next test is to confirm that the main switch will trip timeously in the event of a short circuit. The requirement is that in the event of a short, sufficient current must flow to cause immediate tripping. Double the rated current of the protected device is considered sufficient to ensure swift operation. The voltage is a known, it will be the declared L-N voltage for the installation, and generally fixed at 230 Volt. Calculate as applicable, and if the tested value is below the calculated maximum, enter the result in the allotted space. In instances where it may not be possible or practical to obtain the prescribed values, for instance if the cable is installed under paving or is otherwise inaccessible and the earth conductor has failed, similar levels of protection can be provided by means of a Residual-current device (RCD) at the supply side of the cable. In Part 12, we will conclude this series and Part 13 will cover the electronic CoC.